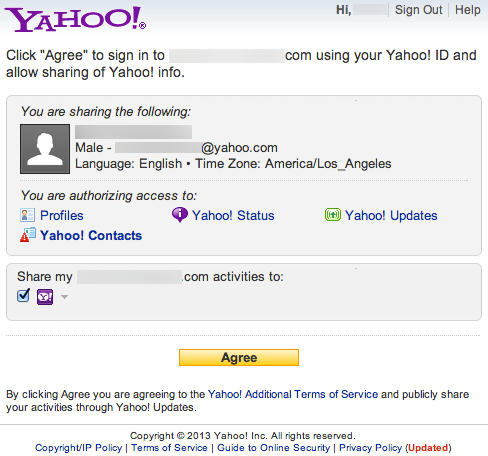 When a user takes advantage of social login, the user is asked for permission to use data from his/her profile, such as email address and name. The process of choosing which information is requested is called setting a scope. Create a separate Social Login application for each site and manage the permissions requested for each application in the Social Login Dashboard. This is ideal for cases where total control and complex analytics are needed. Implement a single Social Login solution and use the Override Scopes feature to manage the permissions requested on a per-page basis. This feature must be enabled for you by your Akamai representative. When present, the scopes setting will override the scopes set for the Social Login application in the Janrain Dashboard. All provider-required scopes will still be present. If no scopes setting is on a page using the Social Login application, the default scopes set in the Dashboard will be used.